No gym membership? No excuse! My regular readers will know I’m a big believer in exercise being really helpful for reducing stress and making you feel generally happier. When all the deadlines are piling up it really helps me to clear my head if I go to the gym for an hour or so, or better still spend a morning playing polo! But what if you haven’t got a uni gym membership? Lets be honest at this time of year the weather isn’t particularly appealing for going for a run in Victoria Park and it’s far too easy to make excuses and stay inside. 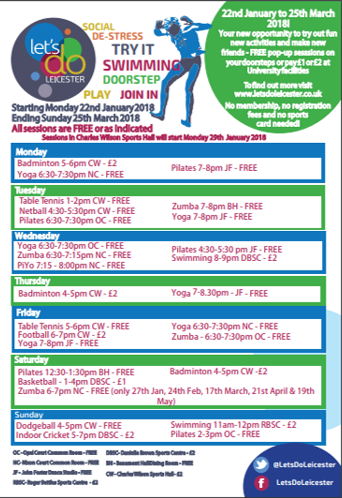 This is a whole programme of free (or very cheap, around £2) exercise classes and sports running throughout the week at different locations such as Opal Court and Nixon Court. You can just turn up, sign in using your uni email address and join in. To see the full schedule of sessions click here. There are a range of classes from yoga to badminton. So far I have only tried the Pilates, but it has been really good fun and I felt like I’d worked quite hard by the end of the class! 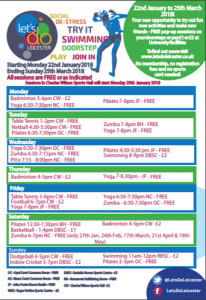 All the classes suitable for beginners, which means if you haven’t done it before you can just give it a go and see if you enjoy it! So really, not having a gym membership isn’t an excuse to not be active!